Can you believe we've never featured a proper RPG with DOS Game Club? Now truth be told, "RPG" is a bit of a vague genre and we have in fact some games with RPG-elements, like Quest for Glory or Starflight. But there are tons of great DOS games that definitely fall into the RPG category and it's about time we play one of those! So our game for January definitely needs to be an RPG. There's actually a thread on the forums specifically for RPG suggestions, so that's where we looked. There are some really amazing games mentioned there, so we had a hard time deciding which one to pick. In the end, it seemed that with the release of the new Fallout 76 game, a lot of people were interested in discovering the roots of the Fallout series, and those are to be found in a game called Wasteland. So that's the game we picked. Wasteland is a sci-fi open world RPG released in 1988, developed by Interplay and published by Electronic Arts. The game is set in a post-apocalyptic setting, in which the USA has been destroyed by nuclear war. The game was directed by Brian Fargo, who later also worked on Fallout 1 and 2. 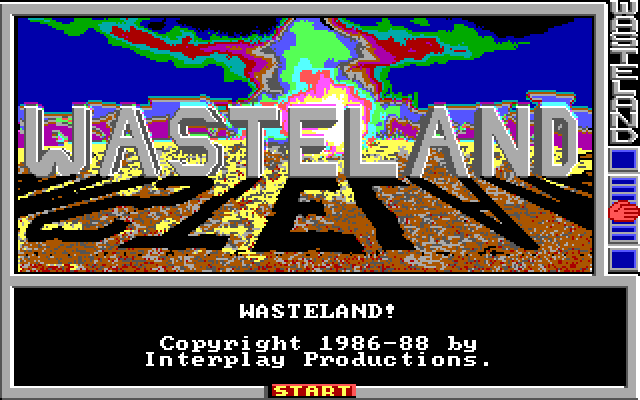 Wasteland was received very well when it was released, so immediately work began on creating sequels to this game. Interplay worked on a sequel called "Meantime", but it was cancelled before it was released. Meanwhile Electronic Arts also worked on their own sequel called "Fountain of Dreams", not involving anyone from Interplay or the original Wasteland team. Sadly, the game turned out to be a bit of a mess upon its release in 1990 and was a big disappointment to fans of the original Wasteland. This is why Fallout (released by Interplay in 1997) is considered the "real" sequel to Wasteland, even though it technically takes place in its own universe. As a side note: an official sequel to Wasteland was actually released in 2014, after a successful Kickstarter campaign, involving Brian Fargo and other people who had worked on the original game. So, if you want to check out the roots of Fallout, or maybe you're just interested in old RPGs in general, come join us in January and check out Wasteland with us!